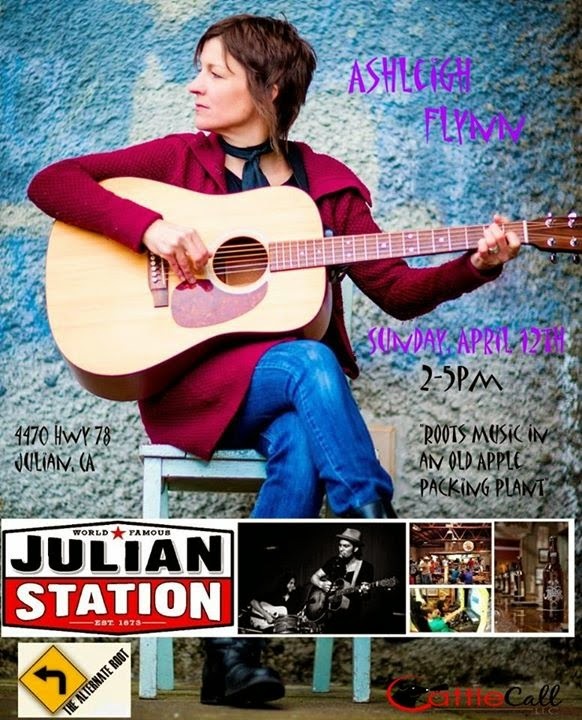 A gifted singer, songwriter and storyteller performs at Julian Station this Sunday from 2-5pm. Ashleigh Flynn - Home Perm Records hales from Portland, Oregon. Enjoy a day of great food, music and tasting from Julian Hard Cider, Golden Coast Mead and The Cooler. Mr. Manitas will be serving culinary awesomeness as always. All shops are open! Live music from Ashleigh Flynn! Music goes from 1-4pm (2-5pm today) every Sunday, year round. Mr. Manitas FRUTERIA will be serving BBQ street tacos, amazing nachos, smoothies, acai bowls, fresas con crema and more! Tasting Roooms: Hard Cider at Julian Hard Cider, Beer at The Cooler and Mead at Golden Coast Mead. Cook Family Butcher Shop: Premium quality locally and sustainably raised heritage pork. Shopping at Ariel's Attic, Cook Pigs, Cowboy Rendezvous, Mini & Me Boutique, The Crazy Racoon and Julian Hard Cider. Arcade, Pool Table, Air Hockey and Young Kids Play Area.